After over a foot of snow had melted and about an inch and a half of rain I decided to make a trip to a couple of waterfalls to see how well they were flowing. 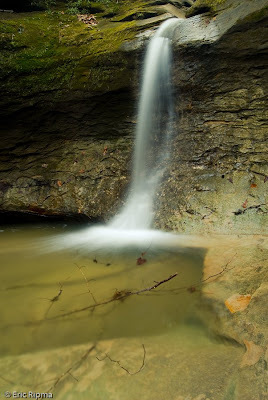 All of the waterfalls I went to flow into Sugar Creek. From the mud line on the shores of the creek you could tell that Sugar Creek had flooded quite a bit but most of the canyons leading into Sugar Creek had already cleared out. There was a decent amount of water but much less than I had expected. To get to this waterfall you have to take two ladders down into the canyon. There were actually fish at the bottom of this falls. 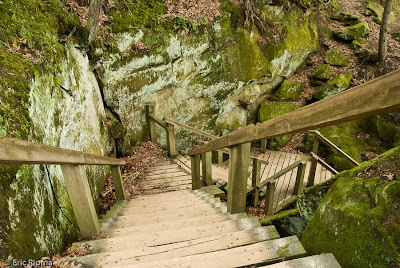 This trail goes along Sugar Creek and cuts through big boulders. The park buildings are on the other side of Sugar Creek but there is a suspension bridge to get to the other side when it is flooded. This waterfall is called the Punchbowl. 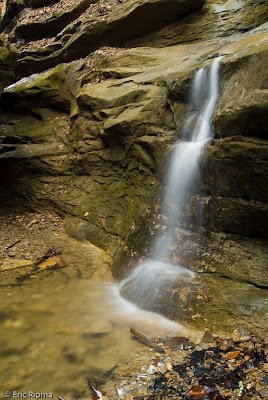 It is in the main canyon in the park and runs into Sugar Creek. Check out more great Watery Wednesday posts by clicking here. Beautiful! I would love to visit some place like that. I'd love to see a waterfall. We have streams but I don' know where to go find any waterfalls. I'd climb down and up those stairs to see that waterfall in person. ;-) I's a beauty. punchbowl! that is an awesome name for such a wonderful shot. I can feel the water now. Beautiful shots. Really like the shot with the stairs. The colors are really pretty. Hope you have a wonderful week. Great photos and you have truly captured the wonder of the falls. All those steps down are scary though - glad you not me! Beautiful shots! The last one was really special! PUH - a lot of stairs! Gorgeous. Well worth your effort to get there! I love it! I'd love to go exploring there - it looks absolutely spectacular!!! Well worth making the trek down those steps! Waterfalls are deceiving: they spread their water out to give illusion that they are dropping more than they are. Sort of like a cobra or pheasant, which is of course what makes the show ... and the sound. What a lovely waterfall - definitely worth the effort it would take to reach it. Great photos, a beautiful place to visit I can see. Thanks for taking us along. Beautiful! Looks like a nice hike too. All the water around here seems to be frozen. The waterfall shot is gorgeous, and made even more so by the shot of the stairs leading down to the bottom of the pool. Fantastic.